Jeutontic is a city of 120,000 people built on the very tip of Gaia’s Navel. The city is walled on all sides, but has one unbarricaded entry point from the canyon. Twenty inch high steps go all the way down to the bottom of the mile and a half deep gorge. The steps widen as they go down as well, being about five hundred feet across at the canyon floor and twenty feet across at the top. The steps are made from Lumite, a type of granite that has been magically altered to glow white. The steps can be seen in the canyon from as far as ten miles away at Gaia’s First Wrinkle. After that Gaia’s Navel turns and the steps go out of sight. A great mystery envelops the origin of Gaia’s Navel. No river ever flowed through the ravine and no titanic battle ever took place to scar the landscape. Thus it is assumed that the spot is the actual belly button of Gaia, the Earth Mother. Many clerics have petitioned the gods about where the 125 mile long crevice comes from, but the Olympians remain silent on the issue. Thousands of people have come to Jeutontic to “walk the navel.” The journey through the canyon takes about eight days by foot and there is a small reprovisioning post on the western end. No steps exist on the west side. Instead there is only a massive cliff face. The ledge is scalable, but the climb is extremely difficult, taking three days for the most experienced to complete. The cliff has been nicknamed Dragon Cliff because it kills more people than dragons. 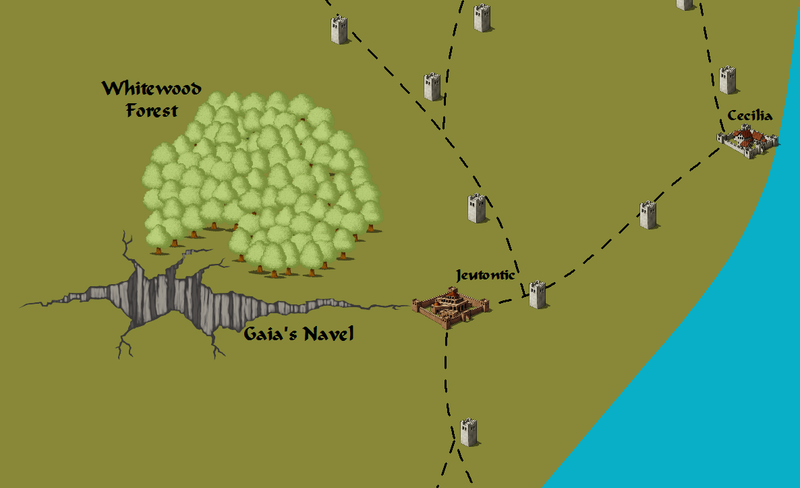 There are many caves and connections to the Underdark in the walls of Gaia’s Navel. This territorial oddity has led to Jeutontic’s greatest problem, attacks from the Underdark, and the city’s greatest advantage, training and selling the flying animals that settle in the upper caves. Griffons, Hippogriffs, Wyverns, Pegasi, and even a few Nightmares, known collectively as aerials, have made their homes in Gaia’s Navel. The people of Jeutontic have been capturing and domesticating the beasts for hundreds of years. A few of the animals are trained to be exported, but most will not fly farther than two hundred miles from the city. They become sick and die if forced to, almost as if a geas/quest was cast upon them. This training regime was implemented to combat theft. Fewer aerial rustlers will take the beasts if they know they can’t be sold for profit abroad. Despite the limitations of the aerials they are still used in the expansive import-export activities of the city. Outposts have been set up within the 200 mile radius that the city aerials can fly to. Aerials fly goods to the perimeter where they are transferred to land-based caravans. The aerials fly back to Jeutontic with commodities dropped off by earthbound merchants. Larger and heavier cargoes that are too big for a single aerial to carry are placed on aerial wagons. The aerial wagon is basically a large tarp draped between two or more animals. With this invention most of the goods that are traded with Jeutontic can be transported between the city and the outposts quickly. Of course a few cargoes weigh too much to be carried even by the largest aerial wagon of six griffons. For these huge loads the people of Jeutontic have elephants. Elephants were originally imported from India as a status symbol for the upper class of Jeutontic. Eventually, one intelligent merchant, Sharlada, realized he could use the gigantic beasts to move his goods from his warehouses in the city to his shops. The practice eventually spread to other businessmen until elephants became the norm for transport of goods and people throughout the entire city. Sharlada opened his own elephant ranch in Jeutontic, so that the useful animals do not need to be imported from India. Sharlada’s descendants still own and administrate the ranch which proudly bears his name upon the entrance. All these creatures being used for transportation and labor puts the people of Jeutontic in a mood for animals. Thus exotic pets of all kinds are popular with the people of Jeutontic. Pseudodragons, cockatrices, shocker lizards, and other slightly dangerous pets can all be found for sale in the marketplace. Jeutontic is the best place to go if a magician wants an exceptional familiar. The most prized exotic pet in Jeutontic is called the Kanroji. It is a magic type of fox that has nine different types of breath weapons, fire, cold, acid, sonic, electricity, force, sleep, positive energy, and negative energy. Kanroji are known to grow very large in the wild, but once placed in a mage’s servitude they will stay the same size until their master’s death. With the numerous pets, aerials, elephants, and people running around Jeutontic, waste disposal becomes a serious problem. The citizens of Jeutontic have come up with a rather ingenious solution, fertilizer. The city’s daily tons of excrement are exported to other parts of the Xorian Kingdom or used in the fields of Jeutontic to grow food to feed the inhabitants of the city to make more fertilizer. A wonderful circle of life. Jeutontic is the biggest trading stop between Cimmeria and Persia. All commodities that travel by land have to pass through the city or risk the wild plains where bandits and monsters live. Xoria has levied a five percent tax on all goods that pass through Jeutontic except wheat and hay. Some smugglers try to sneak valuable goods through the gates by concealing them in hay, but all wagons are checked by the guards of the city. The city watchmen always seem to know when a merchant tries to smuggle something in. Magic is suspected, but no one dares confirm this theory. Jeutontic is one of the most critical cities for the Xorian Kingdom and the one most at risk. It is the kingdom’s main source of income because of the numerous caravans that pass through it, but it is also the first city Persia would attack if the Great King decided to invade. In the unlikely event that a united Cimmeria successfully invaded the interior of Xoria, Jeutontic has been designated as a fallback point. Finally, Jeutontic is the logical expansion point for the creatures of the Underdark due to the tunnels of Gaia’s Navel. The city suffers near constant attacks from Drow, Svirfneblin, Duergar, Dromites, Mindflayers, and the other denizens of the deep. Jeutontic’s citizens have developed effective defenses against all these enemies. For defense against the massive armies of Persia, Jeutontic relies on Xorian battle mages. Persian wizards are obviously not from Cimmeria where magic thrives and are thus inferior to those from Xoria. The Jeutontic division of the Xorian army has also perfected an aerial cavalry unit to be deployed in the case of an attack from Persia. This same cavalry battalion would be used against the city-states of Cimmeria if they invaded, harassing interlopers from up to two hundred miles away from the city walls. The frequent attacks originating from beneath the city are stopped by liberally causing cave-ins. When the underdwellers bring tunneling animals the Xorian army has prepared a special type of freezing water to pour into the caverns beneath the city. The liquid is far colder than any natural water and it releases a noxious, unbreathable gas. The freezing water has killed many of those who live below the city. Should an invading army ever breach the city walls there is an inner keep for the army to fall back to. The keep does not have enough space or resources to support the large population of Jeutontic. The civilians of the city are taught this from a young age and that if a conquering force should enter the city proper they are to arm themselves and fight with all their strength. Thus the potential risk of an armed civilian population revolting is turned into a militia that still serves the crown. The keep itself is defended with large ballistae, stone-throwers, and a contingent of battle mages. Jeutontic, led by Duke Prusu, joined with the Alliance in the First Alliance War against Xoria. Upon losing, Prusu was captured and executed. The city was placed under the rule of the vampiric Rage, Havoc. Havoc vampirized many people within the city and their used their might to subjugate the mortals of Jeutontic. The vampires undertook many raids into the Underdark, destroying many of the previously aggresive communities that lived beneath Jeutontic. Slaves were taken on these raids and even forty years later it is not uncommon for a Xorian family to have an Underdark slave. After King Jevaninada II came to power his first act was to end the vampiric occupation of Jeutontic. He and Blendegad singlehandedly eliminated most of the vampires from the city. The city’s jubilant cries soon turned to sounds of anguish as the old vampires were replaced with new Dragovinians. Many citizens tried to move to Persia, but Blendegad devoured all who fled the city. The people of Jeutontic bowed their heads and offered their necks to the new vampires while simultaneously plotting rebellion. The rebels’ efforts haven’t produced any tangible results yet and the introduction of Dragovinian beasts to ceaselessly watch the streets and alleys of the city hasn’t helped matters.